•	You will need to wear a 2 Piece Bikini – STRICTLY TO BE OF THE STYLE SHOWN BELOW. •	You can not wear Swimming shorts or any other kind of shorts. •	Figure Posing Suits are NOT ALLOWED. These are the ones, where your back straps are like an X and tie into the Posing Suit bottoms. 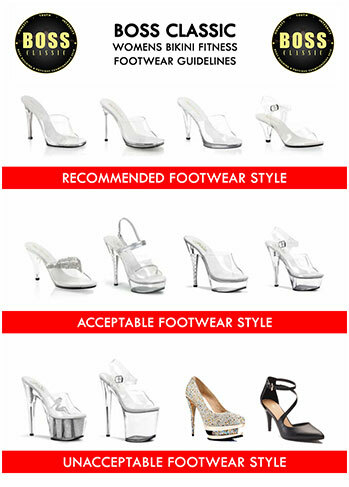 •	You will STRICTLY need to wear TRANSPARENT HEELS on Stage like SHOWN BELOW. •	Same applies to your Make Up. You can do your make up in any way you like. A Pro Tip, brighter than normal make up usually helps under harsh stage lights. Your normal daily make up can easily get washed out under the harsh lights. But, Make Up is COMPLETELY YOUR PERSONAL CHOICE. YOU WILL NOT BE MARKED DOWN FOR THE CHOICE OF YOUR MAKE UP. However, please remember, in this category, your OVERALL APPEARANCE and STAGE PRESENCE can make a difference to your final placings. So, please don’t ignore or take this lightly. •	Bracelets – In fact you are encouraged to wear a bracelet – However if you choose not to wear any kind of bracelet, you will NOT BE MARKED DOWN. •	Stomach Jewelry – Although a small Belly Button Ring Or a small Accessory is allowed. •	Heavy Jewelry is allowed.